¡somos campeones de Europa y del mundo! 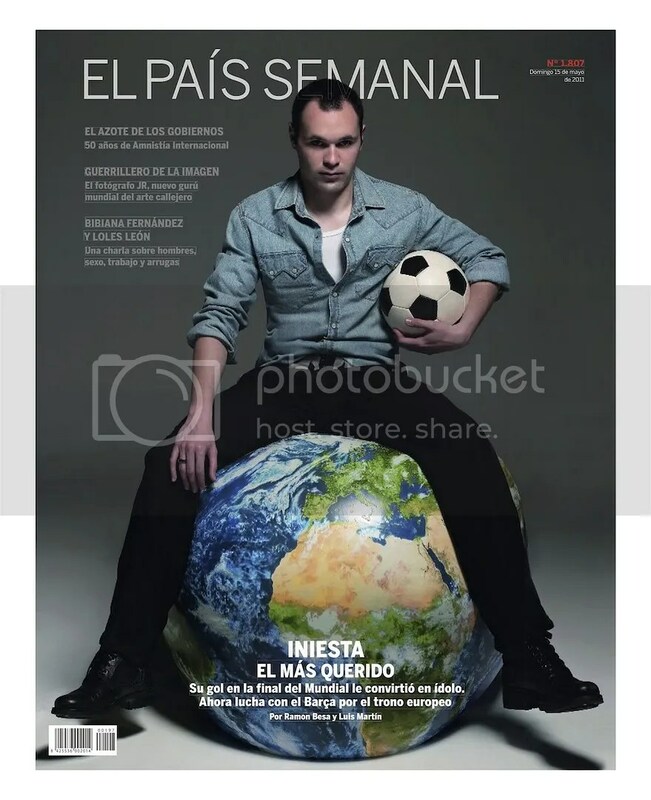 Andrés Iniesta is on the cover of this weekend’s EPS, the Sunday magazine produced by El País. 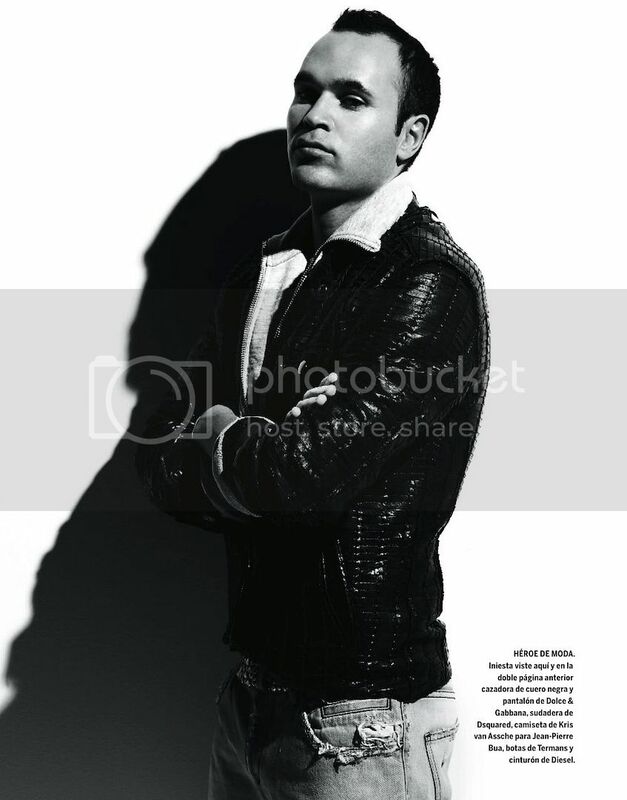 Inside, they have a quite lengthy article/interview (10 pages are dedicated to Andrés), as well as a fashion shoot, although I think the results (the styling and the photography) make him look a bit like a vampire, especially in the black and white photo. Anyway, the article/interview is quite interesting, and there is a lot on Andrés’ childhood. So here it is, excluding all the club-related parts, of course, although in some cases it’s unavoidable. Andrés Iniesta is called Andrés for his paternal grandfather. In Fuentealbilla, there are three Andrés Iniestas: the footballer and two of his cousins, the sons of the older brothers of his father, José Antonio. Coincidentally, his maternal grandfather is also named Andrés. Andrés Luján had a bar in the town, which he managed with his daughter, and it was closed 10 years ago. When Andrés was a kid, his father saved for three months to be able to buy him a pair of Adidas Predator boots. Back then, he played football in “la pista,” which was what the sports center of Fuentealbilla was called, with its cement floor, two futsal goals and two baskets. He played there until he was eight, when he passed the entrance exam to enter the lower categories of Albacete. He played anonymously at Albacete until he was chosen as the best player of the Brunete tournament, and caught the attention of Barcelona. But there was a problem. At that time, one had to be 14 years old to enter La Masía, and Andrés was only 12. The club explained to his family that they would pay special attention to the kid and would reserve a place for him for three years. However, several weeks later, another kid of the same age named Jorge Troiteiro who had shone in the Brunete was accepted into La Masía, after his father took him there to demand his entrance. The club accepted him and then called Fuentealbilla for Iniesta, because then at least the two of them could keep each other company. Andrés’ mother had not even considered allowing her son to go to Barcelona, but her husband convinced her that this was the best option for their son’s sporting career. Andrés remembers, “my father told me, ‘sometimes the train only comes by once in life,’ and I told him that I didn’t want to go.” Although his answer was firm, he still thought about what his father had advised him when he was in bed, with a poster of Laudrup and another of Guardiola above his head. Until one day, Andrés told his father, “Papá, call Barcelona.” And his father called them. The idea was not to return, at least during that same year, but that phrase about the train only coming by once in life continued to run through the mind of Andrés. Two weeks later, Andrés decided to become one of those 99 manchegos who would go to Cataluña in 1996 to achieve their dream. on the World Cup goal: I knew that it had to be the World Cup of Spain. I was convinced. It had to be this time or it would never be, it had to be for the coach, for the players, for the feelings, because it was our turn. I had a horrible time during the season and I knew there wouldn’t be a better place for me to find myself again. And in the end, I felt like a footballer again, I was happy again. The World Cup freed me from a terrible year on the personal level. I suffered a lot to have those few moments of glory. The goal helped me to change for the better, to gain confidence, to have continuity. on his personal identity: I’m from Fuentealbilla, I was born in Albacete, but I feel as Catalán as anyone else. I’ve spent more time here than in Albacete, and I identify with both places. I grew up here and I’m a very lucky person: Barcelona and Cataluña have given me and my family everything, and I feel and we feel like we’re from Cataluña. I know where I’m from and where I came from. He’s a simple person who lives for football with passion, so much so that he usually watches games on the same night as they’re played. He sits there in front of the television with his friends, among them the two brothers that make up Estopa. He loves listening to “Como Camarón” because it inspires and calms him. He combines football with his physical education studies and English classes. Soon, he’ll give a press conference in Catalán. But right now, his main focus is Valeria, the first child born out of his relationship with Anna. Posted on May 15, 2011, in interviews and tagged iniesta. Bookmark the permalink. 23 Comments. i have a lot of respect for don andres. may he have more years of football ahead of him. he deserves the success. and the tribute to dani jarque brings tears to my eyes every single time i see it. even now, 10 months later. Well, Andres should be practicing more conversational English for he will have the opportunity to talk with President Obama. Una thanks for the article. Very sweet. And yes, he does look like a vampire. 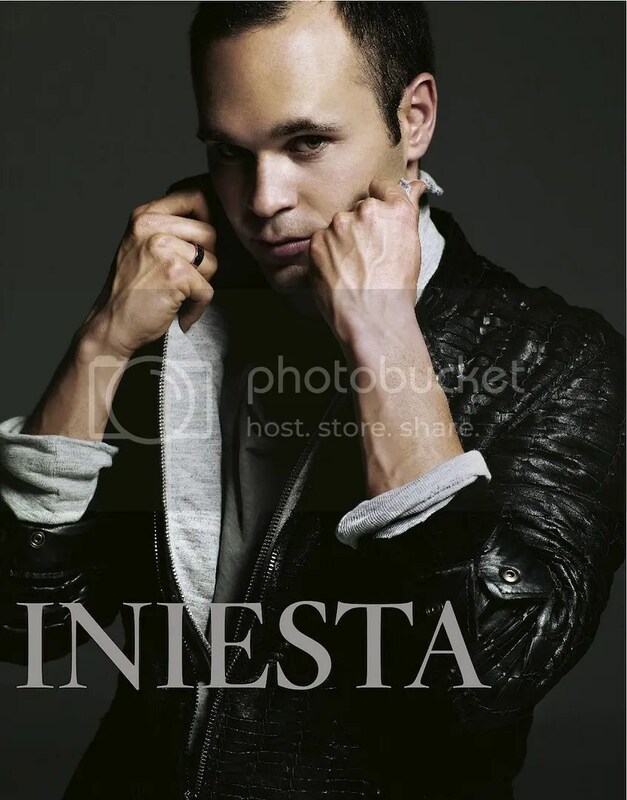 But I love Sweet Sweet Iniesta nonetheless. Hmm, good point about learning English! How many La Roja players speak English? And who is learning (and can I help :))? I believe English speakers are the EPL or former EPL boys: Cesc, Pique, Pepe Reina, Torres, Xabi, Arbeloa and Silva. Learning or some knowledge of English are Iniesta, Iker, Ramos, Llorente, and Javi (!!!). Villa has some posts in English FB, but I don’t think it’s him. So I’m not sure of Villa, Valdes, Albiol (I thought he was going to learn after winning the WC? ), Marchena, Capdevila, Xavi, Puyol, Navas, Mata, Pedro and Busquets. Well, we don’t call him our tiny vampire for nothing! 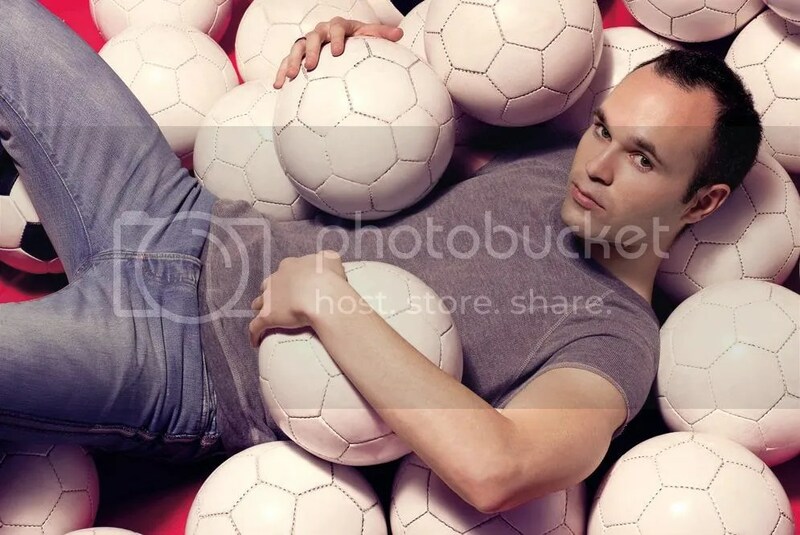 Grande Iniesta! On his wine: He has just presented each of his Barcelona teammates with a case of the first finished batches. On Catalan: He is learning, and has just made his first public speech all in Catalan, at the Liga celebration at the Camp Nou. The crowd ate it up! On the fashion: You can tell he didn’t pick those clothes himself. Ripped jeans and a shiny jacket? LOL! I guess he borrowed those from his teammates? As we know that Daveehd really is into ripped jeans and Xavi basically needs black shiny items of clothing in his closet. 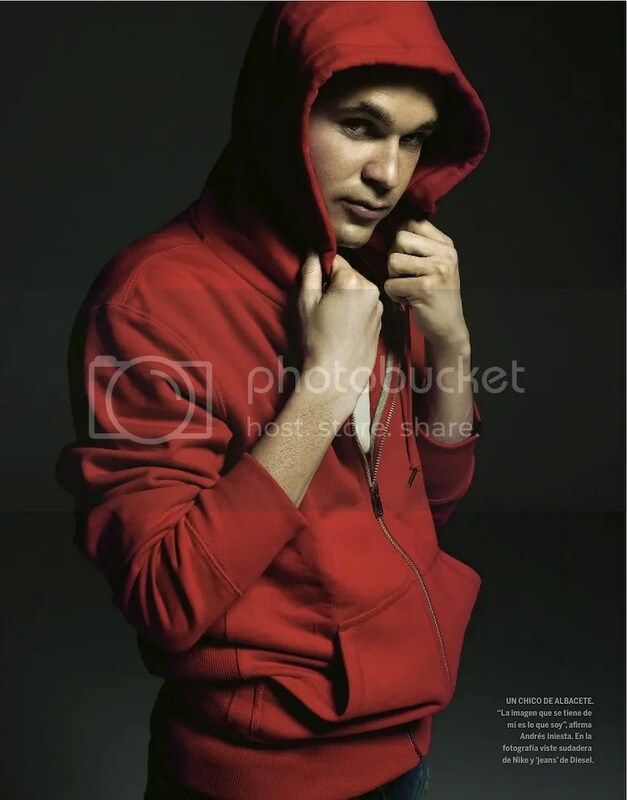 *sighs* I love Andres to pieces, but modelling is just not his thing. Thanks for the translation, Una. Una have you heard anything with Pepe Reina & his wife??? & have you see Leo (Fernando Torres son) … He is going to be just like his daddy … he is already working on his B!+[H face .. jajajaja … everytime i see any of the La Roja kids … I just can't believe how adorable all of them are …. That’s not his daughter actually. It’s the daughter of the photographer. I simply adore this guy! He is an angel. Thanks for the translation Una. Wonderful piece. He’d like to visit the Taj Mahal here?! Sure! I’l act as the tour guide! I hope he is learning english :) Thanks for the translations! I’m still amazed every time I read stories about our players and the way their families and themselves had to suffer in order to fulfil this dream of playing football. This great amount of support and love that they share, as well as the taking and eventually giving back is truly inspiring. I hope our boys and their beloved ones will never been torn apart. Andres is a sweetheart, but he and modeling don’t go well together. It just is not him! OT: Now I begin to understand the furor generated by the El Clasicos. I see to what extent fans identify with their clubs’ triumphs and pitfalls. It happens everywhere, not just in Spain! The below post about banner-baiting tickled my funny bone. It seems to be all in good-humored fun (at least as far as I can see. I am no expert on EPL matters). Note that I contributed this comment in humor to offer a dose of perspective and to do my bit to lighten the seriousness that seems to be pervading this blog in recent days. Practicing belief in God is not “the right amount” ? I think he means that his belief in God is just right for him, i.e. it does not overtake his life, nor does it dictate what he does.